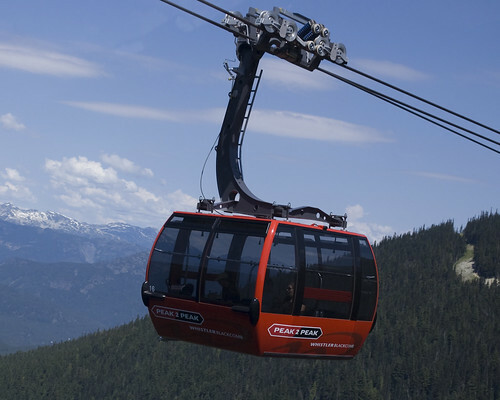 Over the last two years there has been talk of a gondola to transport students up Burnaby Mountain to Simon Fraser University. In recent months, a proposal has been put together and the concept is now up for discussion. Connecting the Production Way SkyTrain station to the SFU campus, the proposed gondola would travel about 2.5 kilometers up the mountain. Serving students, faculty, staff and UniverCity residents, the line would replace the diesel buses that currently run up and down the mountain throughout the day. The gondola will replace one major bus route and is expected to be a mere six-minute ride from Production Station directly to the Cornerstone bus loop on campus. During rush hour, gondolas would leave Production station approximately every 15 seconds, a fraction of the time that buses take. Apart from being more environmentally-friendly, cutting travel times, and potentially being a tourist attraction, there is some opposition to the plan. I lived along the proposed route, attended SFU, and worked at SFU, all-in-all spending nearly 7 years trudging up and down that hill daily via car, bus, bike, foot, and even by hitch-hiking. 1.5 million bus trips a year is the stat that says it all — that’s mind-blowing. It was a boneheaded idea to build a University at the top of a mountain and to isolate it from the community that supports it. Those buses are noisy, unsafe (they can’t keep up with cars proceeding uphill), and must be mechanically strained by the climb and descent. Translink could probably make a business case for paying for this on its own within 10 years. And the towers would probably be so high over the houses near Production Way that noise or privacy concerns would be fairly moot. If it offers yet another efficient, speedy way to commute up to SFU, I think the idea of building an aerial tram to move students and other visitors should be given serious consideration. For comparison purposes, I think the example of Portland, Oregon’s aerial tram that goes up to the OHSU campus should be studied by SFU. The Portland, Oregon example could provided some constructive suggestions as to how it can be done here in Vancouver, Canada. I agree with you however, a gondola (Burnaby) and tram (Portland) should not be confused. A gondola is much more efficient, faster and cost effective than a tram. A tram only has two cabins (one running in each direction) which reverse when they get to the terminus. A gondola has many cabins travelling in a loop. Though a tram typically holds more passengers the time it take to move them is significantly longer. The root needs a tweaking. Put it up production way, up Arden along the side of the golf course then up the power lines route the put a station at burnaby Mountain at the end of the parking lot then east to the sfu campus. It would add 5 mins to the journey but would make it more inclusive to burnaby residents as a whole. I mean lake city way, not production way.. In all, I think it adds a lot of value to the province of BC, the university, and the community — along with cutting costs as mentioned. Its not just because of steadily increasing gas prices, cost of buses+maintenance, and labour hours running the bus being saved — but also that is a very dangerous road as is. With a gondola, who wouldn’t get excited to use public transit to school? I think a lot of SFU drivers (both condo residents and students) would see this as a much better alternative to spending 5$ in gas etc. to get their cars up and down the hill. With the proposed evergreen line, they could even eliminate the Coquitlam bus as well. It would even have the economic impact of increasing the condo prices to the development at SFU (good for investor), portray the province as leader in sustainable technology, add to the international appeal to attend for prospective students (thus injecting further into the economy). It is expensive to initiate, but the benefits are clear I’de say. Gondolas don’t tend to turn corners very well, @yumyums. Gotta be a straight line. Sorry but $70 Million, who is going to be paying for that? Us the public or are they adding it to tuition fees. To get ridership on the Canada Line they made all buses from Whiterock and South Delta stop and transfer onto the Canada line, then they come out and say how popular the line is. Translink comes up with great ideas, NOT. The first rapid transit line should have gone from SFU to UBC via Broadway not to New Westminster. I honestly cant even understand how they come up with projects this stupid, what a gigantic waste of money in my opinion. There are like a billion more projects that are more important, i read that snow closes approx 10-15 days a year. Your going to build a 140 million dollar gondola to save 10 days a year!? Are you kidding. This is nothing but a fancy toy, there are plenty of areas that have snow, hello ski hills? Im sure there are much cheaper ways to fix the road, make it less slippery, more machinery, something better. OR if SFU feels they need this as I hear it is an sfu person who came up with this initial proposal. The SFU should come up with 100% off the money to build it, what does the rest of the majority of people in this province have to gain from this, beside.. oh wait NOTHING. How about some better transit services for abbotsford, langley, cloverdale, surrey, Im sure WAY more people would benefit from rapid transit through these areas to downtown. I’ve lived in the Forest Grove area of Burnaby Mountain for nearly 19 years. I was amazed to find such a wonderful escape from the hustle & bustle of the city after only a 40 commute from Vancouver. Over the years I have grown to love so many things about this location. Things like the beautiful huge trees surrounding us and the gorgeous skyline (we can actually star gaze here), the peaceful sounds of the streams that run through our property, the sounds of the wind blowing through the trees, the sense of seclusion with the forest surrounding our homes, the birds and wildlife right in our backyards living right next to a forested area. I spent some time looking for more information about the SFU Gondola Project and found there have been discussion/plans in the works as far back as 2009. I am angry that the first meeting, where Translink decided to consult the residents here at Pine Ridge Co-op took place less than 2 weeks ago and we are in Phase Two of the Gondola Project!!! There was a meeting held with one or two other complexes near ours but there are many more concerned residents in the Forest Grove area who did not get any meeting or consultation at all. I definitely can understand the benefits of this project but I do not believe the route most favoured by planners (the one which goes right over the building I live in) is the best one. I believe that there are other options available that will not impact as many residents or the surrounding forest. I also have questions about the effects this project will have on soil stability on the side of the mountain or the fragile ecosystems within our forest and streams. I do not want to see Gondola cars traveling over top of our building and through the middle of our complex every 40 seconds for approximately 20 hours of the day. Why is this project suddenly taking priority over the Evergreen Line, UBC transit extension, improvements to sky train stations, and new bridges etc. I think the main reason for the development of the SFU Gondola Project has nothing to do with the SFU student population. I truly think the main reason and motivation for building the SFU Gondola (as another Forest Grove resident put it) is driven by SFU community Trust and UniverCity & property developers who want to offer some flashy method of tranportation to meet the needs of current condo owners as well prospective condo buyers. Translink and Univercity, I think its time for some honesty about the real facts and need for an SFU Gondola. I know many other Forest Grove residents feel the same way I do and we will not just sit quietly while Translink and Univercity planners destroy the very reasons why we chose to live here in the first place. I am completely opposed to the route of the gondola. It is above a residential area on Forest Grove Drive. I have lived here for over 20 years and it is a beautiful area with forests, friendly people and beautiful trails. This would be right above our heads and sitting in our yards or balconies we would be subjected to constant clanking noise and the feeling you are being watched all day and into the night. One question, would you want this above your heads? The property values would plummet. There are other routes please pick one that is not over a residential area. This cannot go over a residential area period. Remember the fast ferry fiasco? Put a station at burnaby mountain then from there, go to sfu. A station at burnaby mountian would benifit all burnaby residents,not just students. I also strongly oppose this gondola project. I too also live in the beautiful Forest Grove community. This project only benefits the Sfu trust and univerCity. It’s been quoted as costing $120M, but what about the additional funds they are now trying to butter us up with, purchasing homes at fare market value, paying for privacy screens for homes directly affected by the gondola route, lump sum payments for residents affected by the constant view of a gondola above their heads 21 hours a day. Who’s pockets do they plan to pull that from? This project is far from transparent and ethical, yes it may seem like the proper environment solution, minimizing greenhouse gases… Do your research before you jump on the bandwagon and cheer for a ride up the side of a mountain in 4 minutes. Would you want a gondola above your head and family every 40 seconds, 21 hours a day, 365 days a year. I am against this project as I feel there are more effective places Translink can spend their money on. When you consider the erratic ridership to SFU (I see nightime and weekend buses empty) and the fact that people living on the mountain whether students or condo owners at Univercity have a $20-$30 all you can eat pass there really isnt much sense to spending millions of dollars for a Gondola. As well it appears from the project details most, if not all the routes will continue to operate at the same frequency before and after the Gondola so there will be marginal reductions in buses going up to SFU. Translink squeezes a ton of money from Greater Vancouverites and Translink should be looking at spending the money as it was theirs not as if it’s a never-ending flow from the taxpayers. Another bad decision by TransLink. What ever happened to the more needed skytrain extensions to Langley and Coquitlam. More people will benefit from these extensions compared to a gondola up to SFU. This means less cars from Langley and Coquitlam to downtown. Oh wait, maybe this is all planned so you have to drive from Langley to downtown, which means you have to pay toll. So goodbye skytrain to Langley… hello toll fees. This is a ridiculous idea that should not have even been considered in the first place let alone gone to Phase 2 already. It’s driven completely by developers at SFU and will do nothing to benefit 95% of the population. Someone is getting a huge payoff to make this project happen! Translink needs to stop this madness and spend their dollars in ways that will truly benefit our transportation system for other areas in need – and there are many of them.